Diacerein (INN), also known as diacetylrhein, is a slow-acting medicine of the class anthraquinone used to treat joint diseases such as osteoarthritis (swelling and pain in the joints). It works by inhibiting interleukin-1 beta. A 2005 Cochrane review found diacerein to be slightly, but significantly, more effective than placebo in improving pain and slowing the progress of osteoarthritis in the hip and knee. Diacerein-containing medicines are currently authorized in the following European Union (EU) Member States: Austria, Czech Republic, France, Greece, Italy, Portugal, Slovakia and Spain. Diacerein works by blocking the actions of interleukin-1 beta, a protein involved in the inflammation and destruction of cartilage that play a role in the development of symptoms of degenerative joint diseases such as osteoarthritis. 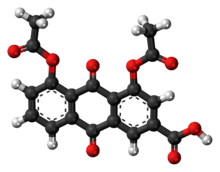 Due to its specific mode of action, which does not involve the inhibition of prostaglandin synthesis, diacerein has been shown to have anti-osteoarthritis and cartilage stimulating properties in vitro and animal models. Due to its excellent gastro-intestinal tolerance, a combination therapy with an analgesic or a NSAID may be recommended during the first 2–4 weeks of treatment. The most common side effects of diacerein treatment are gastrointestinal, such as diarrhea. Due to the risks associated with severe diarrhoea it is advisable to start treatment with half the normal dose (i.e. 50 mg per day) for the first 2 to 4 weeks, after which the recommended dose is 50 mg twice a day. Discoloration of urine (yellow or pink) is another side effect of Diacerein. This effect is due to the elimination of rhein metabolites via the urine and no clinical significance has been found; it may also be dependent on general fluid intake. Diacerein should not be administered during pregnancy and lactation. It is also should not be used in any patient with liver disease or a history of liver disease. Diacerein should not be taken below 15 years of old as no clinical studies have been undertaken in this age group. The usual dosage of diacerein is 50 mg twice daily, after meals, for 3 years. It is marketed in Egypt and the Middle East by Eva Pharma. The Original product company was TRB Ltd. Swiss. In Pakistan, Bangladesh and India, Diacerein is marketed and sold as a single preparation or combination with Glucosamine Sulfate. In Greece it has been sold since 2001 by Faran Ltd. under the trade name Verboril.